We carry the unique materials that will make your outdoor railings truly something to hold on to. Whether you need a little extra privacy, or want some added security, it is important to make sure your backyard masterpiece is safe. We don't just install your deck, pergola or gazebo. We make it unique with our wide selection of accessories for your outdoor living area. If you have the space, a gazebo would be a great addition to your backyard and are usually freestanding, roofed, and open on all sides. 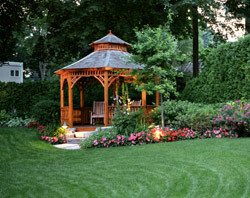 As a unique feature for any backyard haven, they provide shade, shelter, and ornamental features for a landscape, as well as a place just to rest and enjoy the outdoors. At Sundeck Supply, we use nothing but the best products from Country Lane to help build gazebos of all shapes and sizes including octagonal, oval, and rectangle, with either wood or vinyl materials available. Imagine an outdoor room perfectly suited to your needs. Whether an office or a poolside changing room, a cabana provides an indoor space for anything you wish, while overlooking the magnificence of your backyard landscape. Our quality cabana line from Country Lane includes detailed options that will complement your home from stained or painted wood siding to asphalt, wood, or even rubber shingles. Country Lane offers fully customizable cabanas that you just won’t find anywhere else. All Country Lane gazebo materials can be distributed in and around the areas of Laurel, Fulton, Highland, Columbia, Silver Spring, Clarksville, and Ellicott City, MD. Our full product line is also available via delivery to VA, DC, WV, DE, and PA.
Sundeck Supply Inc. serves the areas in and around Burtonsville, Laurel, Fulton, Highland, Columbia, Silver Spring, Clarksville and Ellicott City, Maryland.